Over the last few weeks, I’ve been roaming the innovation landscape to get a better view of the boundaries that divide the landscape into four quadrants. I started in the second quadrant (research) and through the third (disruptive), before I visited the first quadrant (business as usual). This short series is coming to an end in the most remote part of the landscape: the fourth or wicked quadrant is characterised by deep uncertainty: nothing is known, nothing is established, neither rules nor tools are defined or available. That makes this fourth quadrant the antithesis of the certainty that shapes business as usual; but what does that mean for innovation in the fourth quadrant? Let’s step a little closer. Innovation in the fourth quadrant tackles the truly difficult challenges of society, those that are framed by unknown ideas (we don’t know the building blocks for potential solutions yet) and novel problems (either truly new or unacknowledged). These challenges are certainly complex, and they are often even perceived as chaotic (though that perception is rarely correct). To get even closer, let’s consider a few examples, think about climate change, about failing states, and about pandemics. For these problems, we don’t have rules or institutions readily available. Though some laws or procedures will partially exist, those institutions may not cover the challenge in its entirety, for example: Who is the international governmental authority to ensure that solutions that could limit the effects of climate change are implemented? Sometimes, the existing rules and institutions may make it difficult to act on such a challenge, for example: a failing state is often ridden with internal challenges ranging from ethnic tensions to civil war, but the international community sees its hands tied as long a conflict remains an internal affair. At the same time, we don’t have the complete picture of a potential solution either: we don’t know enough to solve the problem. In some cases, we might have the broad idea, but not the concrete knowledge, for example: in the case of pandemics, the cure to an infectious disease is tailored to the specific virus, and even though we know how we fended off the previous virus, we need to invest significant research efforts to develop a new shield for every new virus. There might even be conflicting opinion about the scientific evidence, whether or not the problem exists at all. In the case of climate change, the discussions about the human influence on the observed increase in global average temperatures are ongoing even amongst scientists themselves. 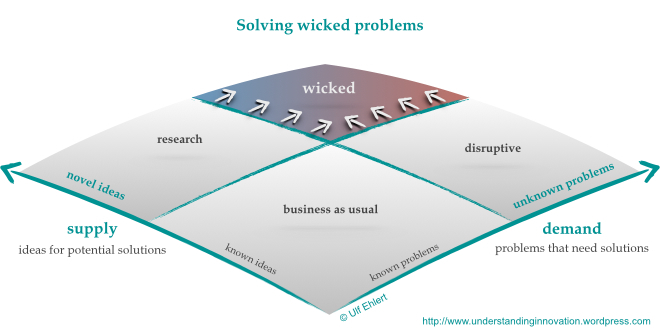 These kinds of wicked problems are complex in two different ways, along both axes of the innovation landscape: one is in the breadth and depth of knowledge required to develop the ideas for potential solutions, the other is an international scope that often exceeds the limits of our existing institutions. As our standard rules don’t apply, and the available tools and building blocks are insufficient, there is no simple approach to tackle this problems. This situation is further aggravated by what I’d call the decoupling of problem time from solution time; the problem evolves according to its own timeline, and our ability to influence or even only cope with that timeline is limited. We cannot simply scale up or accelerate our efforts to meet the speed with which the problem evolves; and we cannot delay or retard the evolution of the problem either. Therefore, the wicked problems present significant risks to society. It is therefore self-evident that innovation in the fourth quadrant is –and must be– focused on developing and implementing solutions to overcome those wicked problems. Any pushing of the boundaries will only be a welcome by-product. Unlike innovation in the first quadrant, innovation under wicked conditions can itself move the boundaries, and even both boundaries at the same time; more precisely, it can pull the boundaries, drawing them in. At the same time, and similar to innovation under the conditions of business as usual, the boundaries of the wicked quadrant are pushed by the efforts in the second and third quadrants. All of that seems to indicate that the fourth quadrant is anyway shrinking, and if it was only through the results of innovation in the research and disruptive quadrants. Which would imply that the wicked problems are miraculously resolved indirectly, without dedicated and targetted effort. Could that possibly be true? I see two problems with that impression. First of all, the outer limits of the innovation landscape are undefined, or rather, there is no distinct end to the innovation landscape. A definite statement on the “surface area” therefore is difficult to defend. While it is obvious that the first quadrant is growing to the extent that the boundaries are pushed, the other quadrants are not necessarily shrinking by a similar measure. Suffice it to say that the fourth quadrant will not disappear entirely. Still, the outer perimeter of the landscape is probably a separate topic for consideration. The second problem I see is related to the double complexity I’ve alluded to above: wicked problems are complex along both axes of the landscape. And I see every reason to believe that those two dimensions of complexity are coupled; that’s a natural part of the wickedness of these problems. Therefore, an effective solution to such a problem necessarily requires the coupling of two different efforts: one is the research effort that seeks new ideas, new tools and building blocks; the other is the disruptive effort that shapes new rules. Successful innovation in the wicked quadrant needs the combination of the characteristic skills that separately shape the second and third quadrants. Such combinations are unlikely to occur accidentally. Solutions to the wicked problems emerge from the co-evolution of rules and tools. Emerging institutions will ask novel questions to research and shape new research efforts ; at the same time, research results will advise how to reshape existing institutions or create entirely new ones. It is the cross-fertilisation between the second and the third quadrants that will create the necessary innovation in the wicked quadrant. And it is a task for society to define and implement appropriate policies that will shape institutions and promote research in a mutually reinforcing way. That’s not just a question of innovation capacity in its own right. First and foremost that’s the question about society’s ability to solve its most challenging problems in order to keep progressing as it has since the Industrial Revolution. P.S. This is the fourth in a series of posts on pushing the boundaries in the innovation landscape. The previous posts addressed the second quadrant (research), the third quadrant (disruptive), and the first quadrant (business as usual). This brings to a close the short series of posts that I had on my mind initially. In hindsight I see merit in an epilogue to present a short synopsis of this series and to take a broader view of the innovation landscape as a whole.